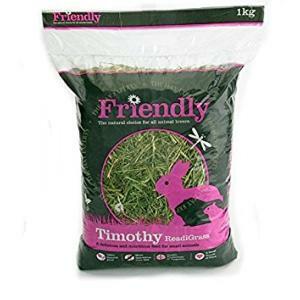 Friendly Timothy ReadiGrass is a blend of rapid dried fresh rye grass with tasty timothy grass, making a rich green and aromatic mix of stalky, leafy, yummy grass with seed heads too. Made in Yorkshire and offers a delicious fibre source to keep your animal healthy. Ideal for Rabbits, Guinea Pigs, Chinchillas, and Degus. Provides vitamins & minerals that are required to maintain health and keep coat shiny.